Steps the government needs to take before removing wolves from the endangered species list. 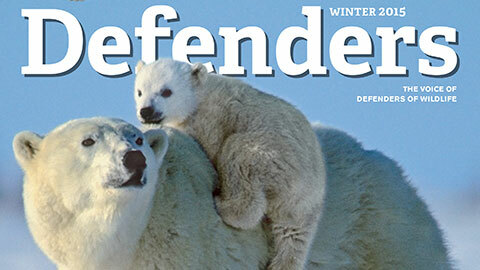 Defenders celebrated a great victory in August when we won our lawsuit on Northern Rockies wolves. A federal judge in Montana ruled that wolves in the region must once again be protected under the Endangered Species Act. Judge Molloy’s opinion makes it clear that the decision by Interior Secretary Ken Salazar, shortly after taking office in 2009, to remove federal protections for wolves in Idaho and Montana was illegal. The Endangered Species Act, this country’s landmark law to conserve imperiled wildlife, requires that such decisions be based solely on science. It does not permit the kind of political accommodation that Secretary Salazar was trying to make, which would have maintained federal protection for the wolf in only part of its range in the Northern Rockies—Wyoming. The court’s decision to uphold the plain meaning of the Endangered Species Act was a major victory for all imperiled fish and wildlife. If Secretary Salazar’s interpretation of the act’s provisions had been upheld, it would have set a very dangerous precedent, allowing future decisions to protect species to be based more on political expediency than on long-held biological principles and science. Regardless of the important court victory, we still have plenty of work to do in our efforts to protect Northern Rockies wolves. Wolves still face extreme animosity in the region. Some in the West have unfairly branded wolves as being such major contributors to livestock and game-animal losses, that they should be broadly eliminated once again. Over the past decade, the U.S. Fish and Wildlife Service has made three unsuccessful—and illegal—attempts to prematurely eliminate federal protections for wolves in the Northern Rockies. Defenders agrees that our common goal should be to remove wolves from the federal list of endangered species—but only when the animals are fully recovered and the states clearly establish scientifically sound management plans to responsibly manage wolves so they don’t backslide and become endangered again. To reach that goal, the most important steps the service should now take are to update the federal recovery objectives for wolves in the region, and to require development of updated state management plans, using the best available science. This is the only way to assure the long-term survival of wolves across the Northern Rockies, and it’s also what the Endangered Species Act requires. The current federal recovery plan and state management plans are based on outdated biological assessments, made more than 20 years ago. Over the past few decades of managing and monitoring wolves we have learned a lot more about their social structure and their population dynamics —and this needs to be reflected in new federal and state plans. We have written to Secretary Salazar and have reached out to the states offering our assistance and our commitment to collaboration as we continue working on our priority goal of securing the long-term recovery of wolves in the Northern Rockies. The goal of the Endangered Species Act is the same for wolves as it is for all endangered species: to restore the species to the point that a healthy population is biologically sustainable and to assure that sound state management plans are in place that assure the transfer of management authority to the states will not again result in endangerment. Success in our endeavor will only happen if all stakeholders come to the table and commit to using the best available science and to working together with a common goal of maintaining a healthy, well-distributed population of wolves across the Northern Rockies landscape. It’s time for us to leave the contentious history of wolf recovery behind, and design a future for wolves that is in the best interests of wildlife conservation, the Northern Rockies and all Americans. These iconic predators—who once ruled from the southern tip of Africa all the way to northwestern India—are at risk of extinction by 2020. The Arctic National Wildlife Refuge is a natural treasure, yet five decades after its founding it remains vulnerable. A federal court sided with Defenders, ruling this summer that the wolf delisting plan illegally removed federal protections from wolves. These endangered canines closely resemble wolves in their pack-oriented social structure. Defenders chief scientist heads to the Gulf to document the oil spill's impact on wildlife. At least 15 piping plover chicks fledged this year at Cape Hatteras National Seashore. Window collisions are the leading cause of death for migratory songbirds.